This pie has been on my mind for a while now. Why I decided to make a chocolate cream pie for the Easter that Mr. E and I were empty-nesters, I don't know. I promise I did not eat half of a pie (in one sitting). First things first, Mr. E is a traditional fruit pie lover. A Key lime (or not-so-key-lime) pie lover. This pie knocked his socks off. 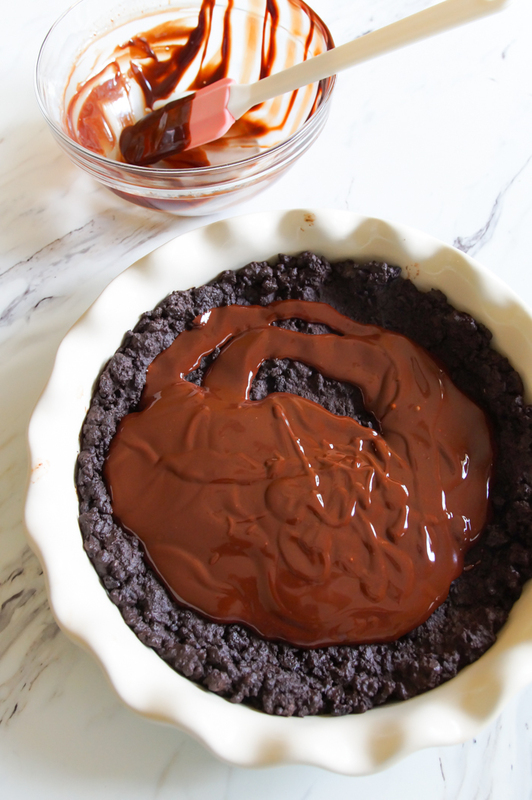 We're going to start off with a chocolate crust. This is not any chocolate cookie crust. This is a chocolate cookie crust WITH more chocolate stirred in! The entire crust is then...covered in a layer of chocolate ganache. While that chills, you make the cream filling. It's super easy. 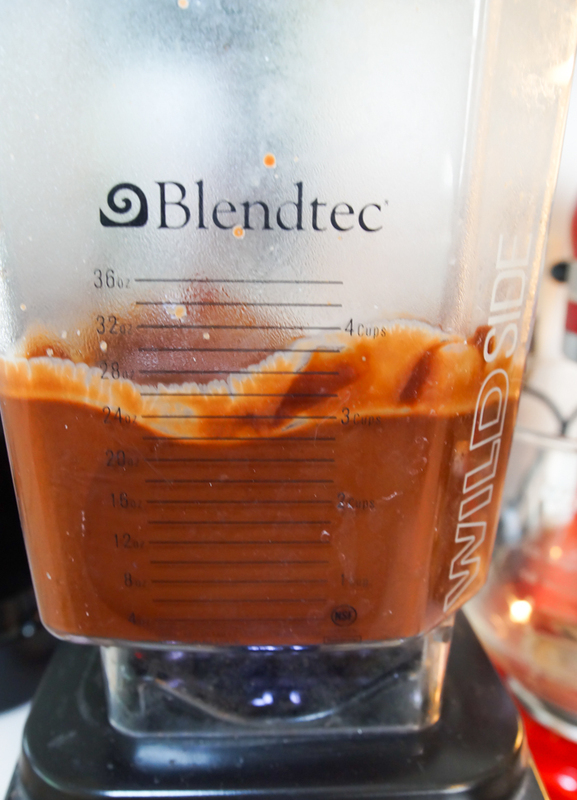 The chocolate component gets made in the blender. Once that sets up, you'll fold in whipped cream. Honestly, I could have forgotten the pie at this point and just eaten the ganache-filled crust. ♥ Look at that! Ok, though. Let's fill it. 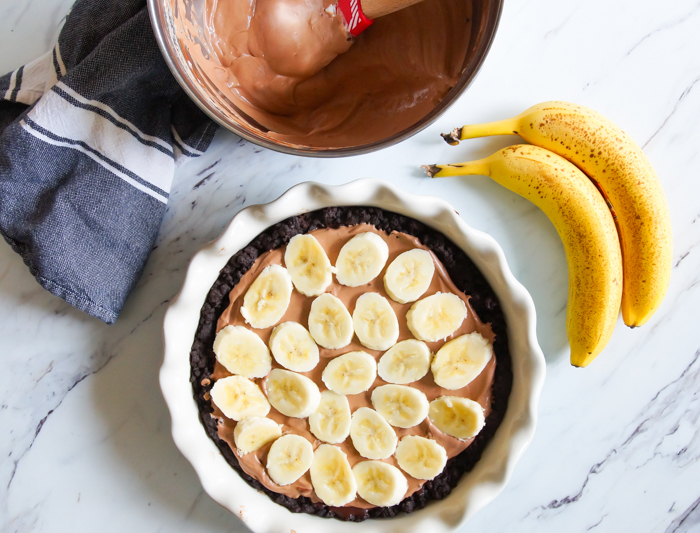 Start with the chocolate cream, add a layer of sliced bananas. Repeat. End with a final layer of chocolate cream. The pie needs to chill for a bit to set up for slicing. Top with whipped cream...or even more bananas if you want. Preheat oven to 350. On low heat, melt the butter and the chocolate chips. Pour over the cookie crumbs, add the salt, and stir until combined. Press into a 9" pie pan. Bake for 5 minutes. Set aside to cool. 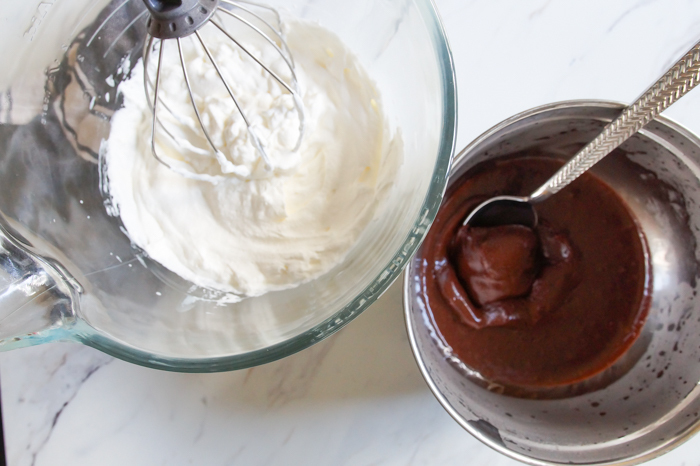 Make the ganache: bring the cream and butter to a simmer. 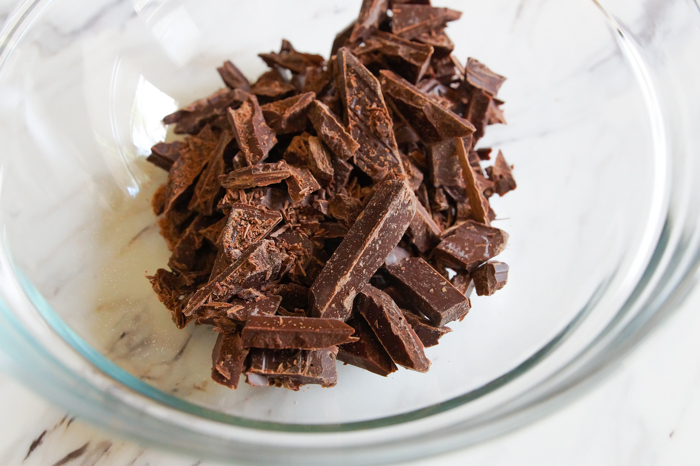 Pour over the chopped chocolate. Let sit for 5 minutes. Add the vanilla and stir until smooth. Pour the ganache over the cooled crust and spread evenly. Refrigerate until ready to fill. Put the cold water in a blender; sprinkle with gelatin. Let sit for 2 minutes. Meanwhile, heat the chopped chocolate, 1/2 cup cream, sugar, butter, and cocoa until melted. Stir in the vanilla. Whip the remaining cream until stiff peaks form. 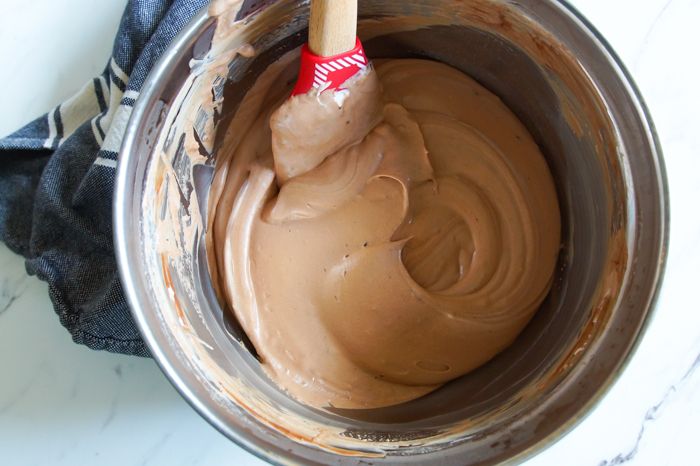 Fold into the chocolate mixture in three additions. 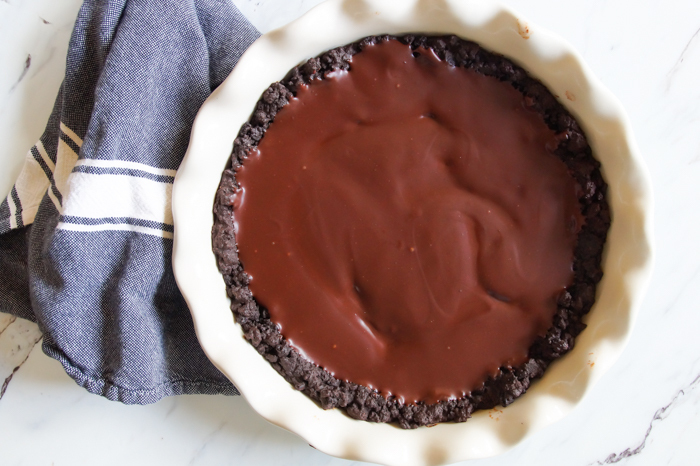 Once combined, spread 1/3 of the chocolate cream into the prepared crust. Top with a single layer of bananas. Repeat. Top with the remaining chocolate cream. Refrigerate for at least one hour before serving. 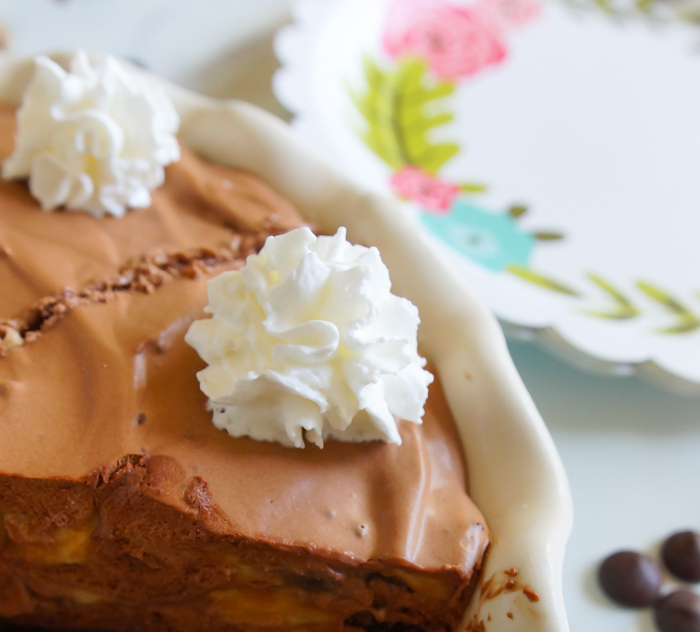 Serve cold with more whipped cream, bananas, or chocolate shavings. 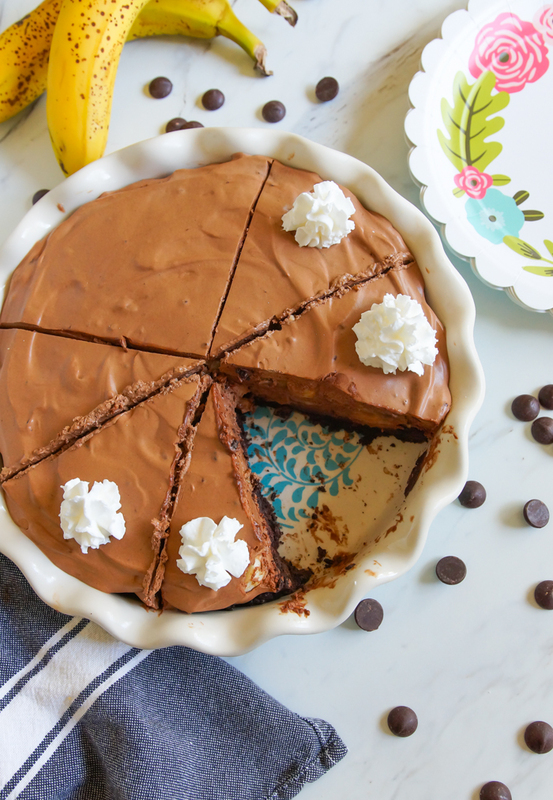 Are you ready for chocolate banana cream pie?